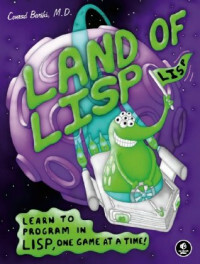 With his brilliantly quirky comics and out-of-this-world games, longtime Lisper Conrad Barski teaches you the mysteries of Common Lisp. You'll start with the basics, like list manipulation, I/O, and recursion, then move on to more complex topics like macros, higher order programming, and domain-specific languages. Then, when your brain overheats, you can kick back with an action-packed comic book interlude!